In my previous post “Hip Openers” in Yoga? Please, Stop the Madness., I discussed the importance of asana evolution. My book, Medical Therapeutic Yoga, is step 1 in Asana Evolution, with its dedication to preventing and treating injury, which includes injuries that arise from sketchy yoga posture practice. Using the phrase “hip opener” is not helping stave off the increase in yoga injuries, nor is it helping the reputation of yoga as a healing modality. It is a tired, worn out, and even dangerous phrase that has whipped up a kind of asana frenzy for pushing folks past logical and safe limits of range of motion. Chiefly, I am talking about those yoga classes that focus solely on asana – squeezing as much range of motion out of the typically under-prepared hip joint as possible, to the absolute detriment of the delicate arthrokinematics and hip and pelvic morphology that varies widely from person to person and condition to condition. Altogether now, as the Beatles sang, say Hip Preservation NOT Hip Opener. If we can (finally) agree to ditch the unhelpful phrase “hip opener,” which assumes that folks’ hips are closed, tight, or somehow in constant need of “opening,” and also places unnecessary pressure (think playground bully) on folks, right out of the gate, to increase their range of motion as soon as they walk in the studio door and step on their yoga mat, then I think we would gain FAR more respect and positive response from not just the orthopaedists, both physical therapists and surgeons who treat the hip, but from the hip itself. How about a little “Balanceasana”? That is, follow through with teaching a balanced class that does not focus on one of the glaring weaknesses of yoga asana – FABER (hip flexion abduction, and external rotation). FABER is the most famous flavor of this century and the last two with regards to asana. However FABER is NOT everyone’s friend. FABER (aka “hip opening”) and its incredible overuse and overemphasis, is the vanilla ice cream of yoga posture practice. There is so much more to asana than plain old FABER. FABER is child’s pose, warrior II, cobbler’s pose, tree pose, but what’s more important, it isn’t the chief movement of the hip. There is also extension, adduction, internal rotation, and circumduction – and each of those ranges are dictated by individual hip and pelvic structure. Read my post on Dominant Movements of Yoga Postural Practices. Practice moderation (and change your nomenclature). Don’t vomit on your yoga mat. Bonus Tip: Ditch the lengthy, repetitive, asymmetrical sequences. Ditch mass market asymmetrical posture instruction. The Hip Lock in Chair Pose. Courtesy of Medical Therapeutic Yoga (Garner 2016). All rights reserved. The asymmetrical nature of a seemingly endless number of postures strung together without consideration for hip morphology can exacerbate any existing hip, low back, sacral, iliac, and/or pelvic pain or even create a problem where one didn’t previously exist. Not all asymmetrical postures are for mass consumption. Take Warrior I for example, which must use the action of chair pose (see the Hip Lock figure (c)2016) for entry and exit into the pose. Warrior I requires hip extension. But for those with hip dysplasia, osteoarthritis, impingement, or labral tears, full hip extension is generally not possible and when attempted could create neural tension, and referred pain or other neural complaints beyond the hip and into the pelvis, deep buttock or pelvic floor, or spine. Further, if the femoral head isn’t being actively supported by the deeper gluteal sling, a kind of hip rotator cuff (see photo at right); then again, Warrior I can cause impairment instead of its intended liberated empowerment. Consider recalibrating Warrior I and II in my video instructional below. 5. To load or not to load? That is the question. Unloaded versus loaded hip movements – Case in point – Upright hand to big toe is a loaded hip movement but reclined hand to big toe is unloaded. Which pose would be best if a person has a suspected hip impingement? Labral tear? Another example is tree pose. Tree pose can be done loaded, in standing, or reclined, in a supported Yoga Couch. Which is best for the person with hip impingement or a labral tear? The answer is not a simple one, meaning, unloading the pose is not always the answer. For example, in those with intra-articular injuries (inside the hip joint), like a labral tear, loaded postures introduce torque (twisting or rotation inside the joint), and can be problematic and increase impairment and/or pain. However, unloaded postures aren’t the catch-all panacea to use as a substitute when loaded postures won’t work. The best case scenario is to refer the person with hip pain to a physical therapist for evaluation, who can help determine the limits of their hip motion and what types of movements or yoga postures will work best. The other suggestion here – make sure to note whether pain or impairment is most notable in the unloaded or loaded position. This is great information that a physical therapist will appreciate as they conduct their investigative analysis of the hip. 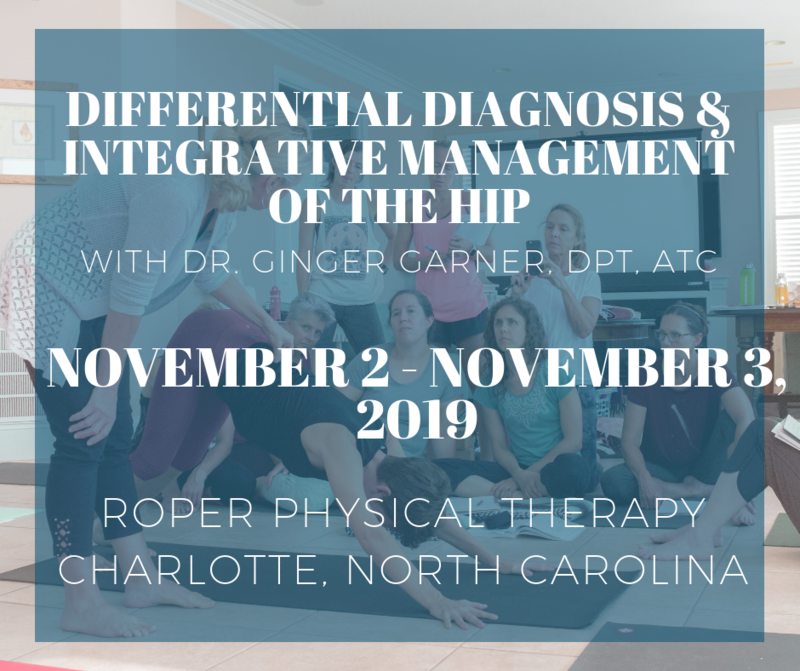 Mechanical presentation of hip limitations – Does the hip appear to have contributions from the pelvic girdle, neurological inputs, and/or is the problem coming from intra-articular (inside the joint) versus extra-articular (outside the joint) variables? If so, what do those look like? Red flags that require immediate referral are referred pain or changes in sensation or motor function (strength or endurance) in the trunk, pelvic, hip, spine, and/or lower extremity area, whether or not they occur in a yoga pose. Typically, a nerve problem that is mechanical in nature is unilateral, but not always. An orthopaedic physical therapist will be able to determine a course of action, and working together as a team, can help optimize what you are able to teach students in a yoga class or session. Be cautious about poses that aren’t “hip openers.” Take eagle pose for example. Eagle pose, along with other similar postures that place the hip in an end-range position, are problem child poses that aren’t hip openers. Yes, all poses matter and must be recalibrated to FIT the individual pelvis and hip. Eagle pose requires enough adduction and internal rotation that could exacerbate or create a hip impingement condition. Hip impingement is a complex condition with multiple causes, some of them congenital and others acquired. This means that we cannot blame all hip issues on the timeless enthusiasm that surrounds “hip opening” in yoga studios across the globe.